The Teatro di Pompeo in Rome was the first permanent, Roman theatre, taking five years to build and was completed in 55BC. Prior to this theatres were simple wooden structures on earthen banks but the theatre in Rome set a new precedence being built of stone and having its own foundations. 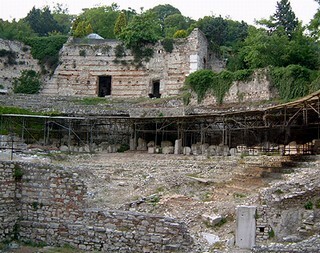 Up until this point theatres were considered temporary structures that were kept outside the city walls and quickly taken down after performances. They were considered dangerous and subversive places, where crowds gathered and orators or plays could whip up the audience into a frenzy. 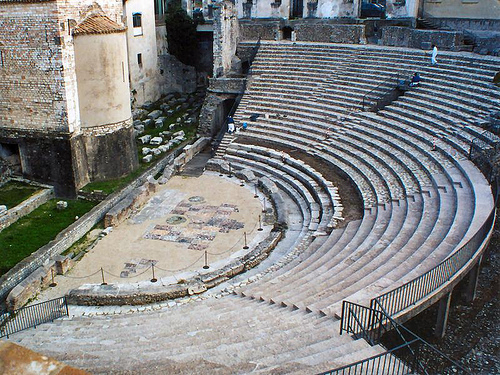 Roman theatres also differed, in that the stage was attached to the auditorium, allowing for better acoustics and the design meant it was easier to control patrons as they entered and exited the performances. Collecting payment was also simpler with this new layout and the Romans invented the theatre ticket, a clay tablet that was issued to all spectators once they had paid. Roman theatres can be found throughout the countries of the Empire with some fine examples in Italy still in use during the summer months. 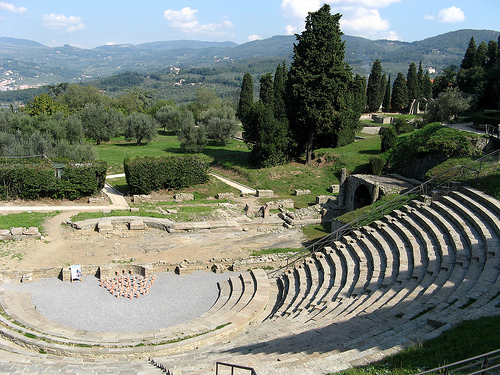 Fiesole in the hills above Florence, 8 km away and is still in use for performances during the summer months today. Much restored, this theatre dates from the 1st century BC. You can still see a lot of the backstage area including the room where the curtain operating device was located and the actors doors leading onto the stage. 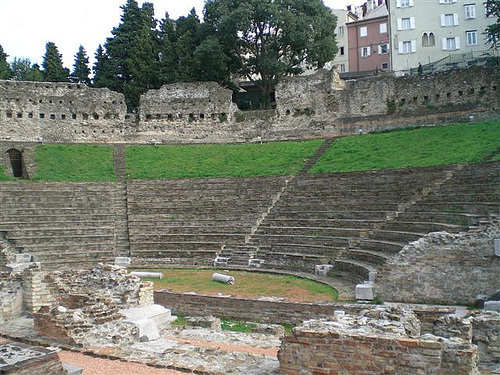 Brescia lies between Milan and Verona, its theatre was built in the 1st century AD over looking the river and with a capacity for 15,000 is one of the largest arenas in Italy. Despite destruction by barbarian hordes and earthquake it was still functioning well into the 12th century. 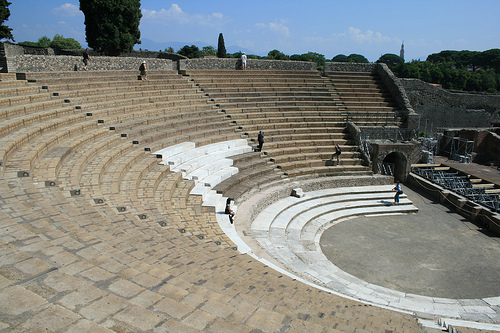 Pompeii, the Grand Theatre is a 5,000-seat theatre was built in the 2nd century BC and remodelled some years later. It was complete with VIP boxes, seats in the orchestra pit and a canopy to protect the crowds. Next door there is a smaller concert hall, which was built around 8OBC and could hold 1,500 people. Spoleto in Umbria has a theatre that has been largely rebuilt and formed part of the church of St Agatha, which now houses the National Archaeological Museum. Still a working theatre in the summer, there are many of the original seats in place, as well as the passageway giving spectators access to the arena. Trieste’s theatre, in the north east of Italy, lies at the foot of the St Giusto hill and uses the natural slopes in its construction and has beautiful views out towards to sea. It would originally have been much closer to the harbour but over time the sea has moved further away. All of these marvellous sites are wonderfully atmospheric places to visit and walk around. They are especially magical during the warm summer evenings when local companies often put on traditional plays, recitals or musical entertainment for guests. Then these old theatres come to life once more. This entry was posted in tours and tagged day out, day trip, entertainment, Italy, music, plays, theatre, tour. Bookmark the permalink.